Teaching children, who are generally full of life and curiosity, avid to learn, like little energetic sponges, is even more rewarding. The work done by the Enos Garcia School students that I have taught for the past three years (third, fourth and fifth graders) is an example of how much can be accomplished with children, in as little as twenty or forty hours during the school semester. I started working with the Taos Municipal Schools’ Visiting Artists Program in 2008. Invited to join the program by its tireless coordinator, Tanya Vigil, I used my skills as a story teller and an author to promote creativity and spread the love of writing among the students. I worked closely with the Dual Language Program student and teachers and taught the kids different ways of writing about their personal experiences… and their imagined adventures. The first year, they wrote completely fictional stories, and illustrated them with their own drawings. The topics ranged from ghosts to mutant rabbits, and some were frankly hilarious. The following year we delved into the realm of true life, and they wrote family histories which were later printed and made into individual books. They used family photos to complement the histories and interviewed the parents, uncles and abuelitos and abuelitas who were elated to see their memories preserved. Both the fictional stories and the family narratives were exhibited at the Millicent Rogers Museum, in the annual shows, in 2009 and 2010. I feel that my classes have contributed to encourage the students’ creativity. I have also worked hard to improve their written abilities in English and in Spanish, which is the focus of the Dual Language Program. Their spelling and grammar, in both languages, were remarkable. In the fall of 2010, while working with fifth-grade students, I decided to complete a more ambitious project. Under the expert guidance of their teacher, Mary Donley-Slover, they wrote, in English and in Spanish, about their town, Taos, and why they liked living in it. Then, to unleash their imagination, I also asked them to write a bilingual poem, too. 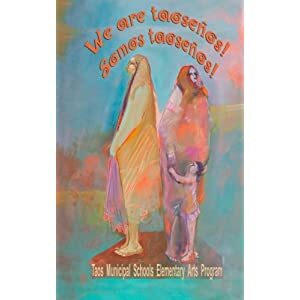 Their articles and poems, collected in the book ¡Somos taoseños!/ We are taoseños! (Eriginal Books, 2011) are a delight to read. I want to thank Vicki Breen, Arts Consultant at New Mexico Public Education Department, Rose Martinez, Director of Instruction and Federal Programs’ Coordinator for the Taos Municipal Schools, her administrative assistant Sandra García and Tanya Vigil, the Visiting Artist Program coordinator, for their invaluable help in completing this project. The book is available in Amazon: We are taoseños! ¡Somos taoseños!